Details: On Monday, July 23, 2018 a female adult reported she was being stalked by a subject whom she had a past relationship with. 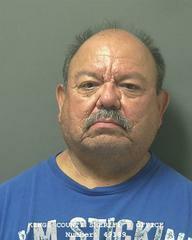 The victim told officers Ronald Subia had been stalking her for the past two years. She mentioned within the last two years, she had observed him parked at her work, and had caught him following her while she was out of town on multiple occasions. The victim stated Subia had threatened retaliation against her if she ever reported him to the police. Through investigation it was also determined Subia had opened and used a credit account in the victim’s name. On Wednesday, September 5, 2018, at 12:30 PM, Corcoran Officers served an arrest warrant for Subia in the 100 block of Sierra Avenue. Subia was booked into the Corcoran Police Department Jail for the arrest warrant charges of Stalking, Identity theft, and Witness Intimidation. He was later transported and booked into the Kings County Jail where his bail was set at $160,000.00.